Yodhi met with Rick Astley at Jakarta airport this morning en route to Singapore. Yodhi told Rick that he was such a fan and grew up with "Never Gonna Give You Up" song, which topped the U.S. singles chart on 12 March 1988. Finally, he took a photo with Rick and recorded a special message frmo Rick to Anggi and Indi, who were playing doubles in a local tennis tournament in Cibubur this evening. PS: Have you tried Rickrolling?. Hilarious. What was he doing in Jakarta? 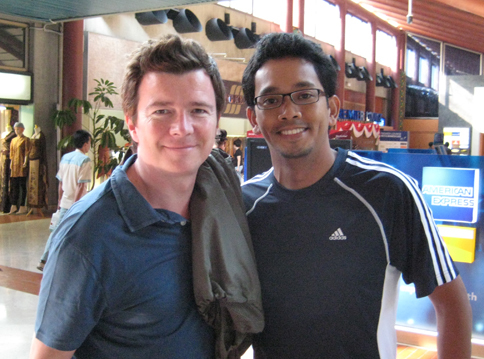 among other famous dudes that Yodhi has met: Ramos Horta, Xanana Gusmao, William Baldwin, and now Rick Astley... talk about some lucky guy meeting all these famous people! Keren banget, Hebat banget Yodhi! damn....this rick not just famous in 80's...this days he just build his reputation again. if i'm not wrong, he join the festival in singapore this august. that's why he in jakarta. Ah sial! gw ngelupain kesempatan itu! enak bnget vto breng ma Rick Astley! abis ini gw mo nge rick roll orang ah...! This can start a whole new mémé!